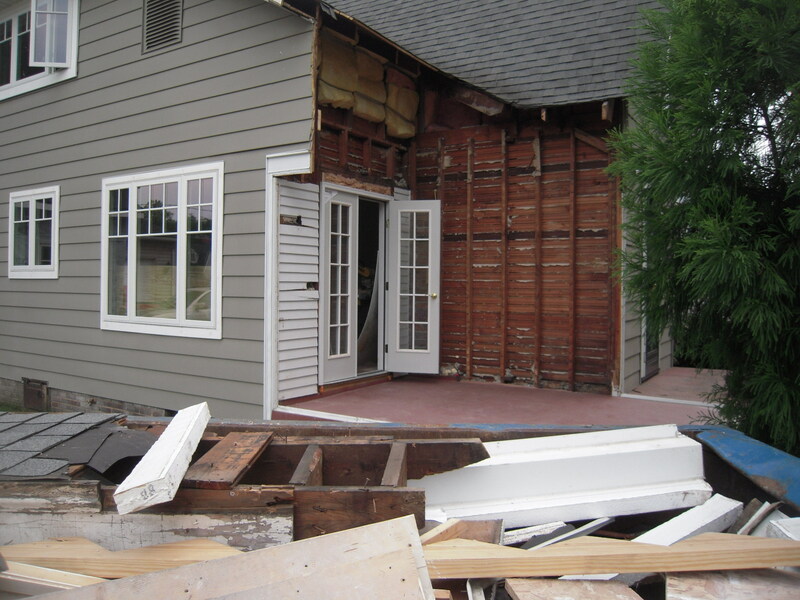 Well, fellow renovators and bystanders – sorry for the delay. Seems like the time has been slipping away – so let’s get back and update the old mudroom. It’s still not finished, waiting for me to get the routers out and make some cabinet doors. All in due time. As I was posting the last installment of this blog I realized that the dryer has a steam feature. Ding, ding! Just registered then that I have to have access to be able to use such a feature – as in you have to get a hose connection to the dryer. So out comes the cabinet again and a new hole was cut so that now I can noodle a hose to that nifty steam feature. Dang that dryer – first a side vent and now this. So about this time a box arrives from Restoration Hardware. When I realized that the ceiling electrical box will need to be changed. So out comes the box, the trim blocks and other already painted stuff. No one said this was gonna be easy all the time. I chose this 14″ Clemson Double Pendant in polished nickel from Restoration Hardware. 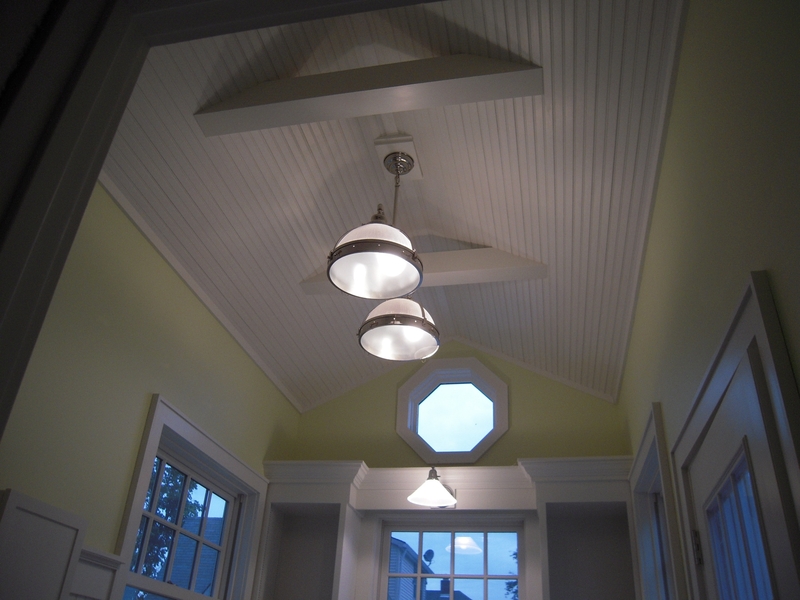 I like this because it has a Holophane type of shade -allowing my bead board trim to get a little light. 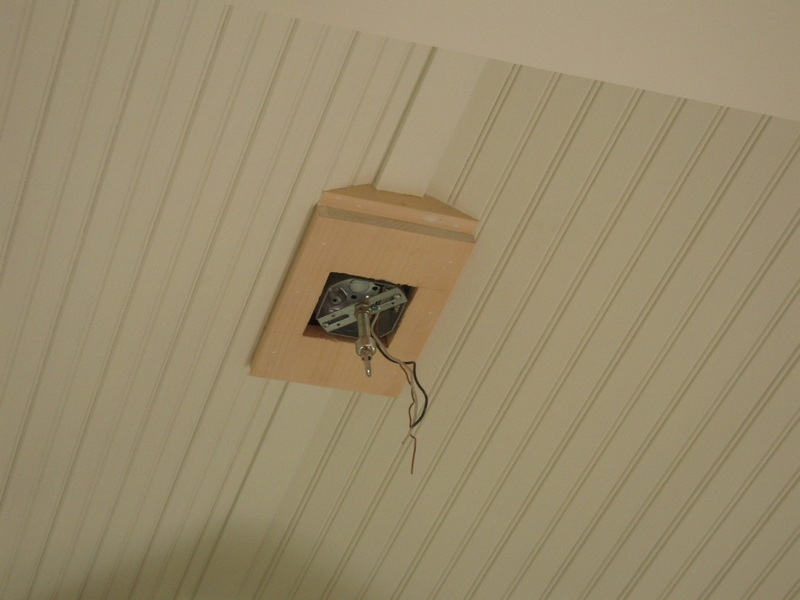 Here I have the lights hung and all the trim painted and back in place, ready to test. Looks like I’ve got lights! And no one was electrocuted – yes! The over the sink light is from Rejuvenation. It’s called the Halfway. This one is in Polished Nickel and a frosted ribbed shade. Next post we’ll get some counters on top and other minor things. Then it’s off to the Sunroom for awhile. It’s been a while since I’ve had a chance to update this little story. Things have been, well just a little busy. 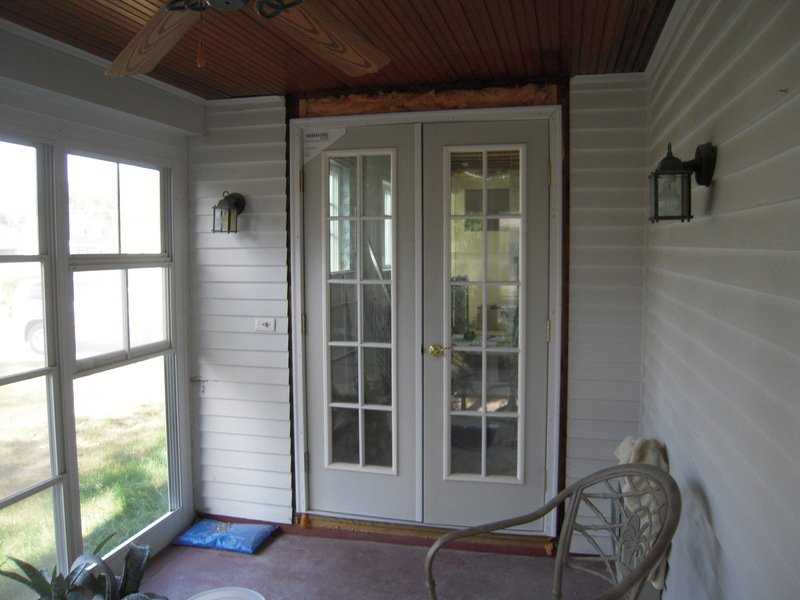 The sunroom renovation is now under roof, anticipating quite a bit of rain for the next few days. There’s lots to tell about foundations and a 20 foot steel beam – but we’ll leave that for another post. Now let’s continue the mudroom build. 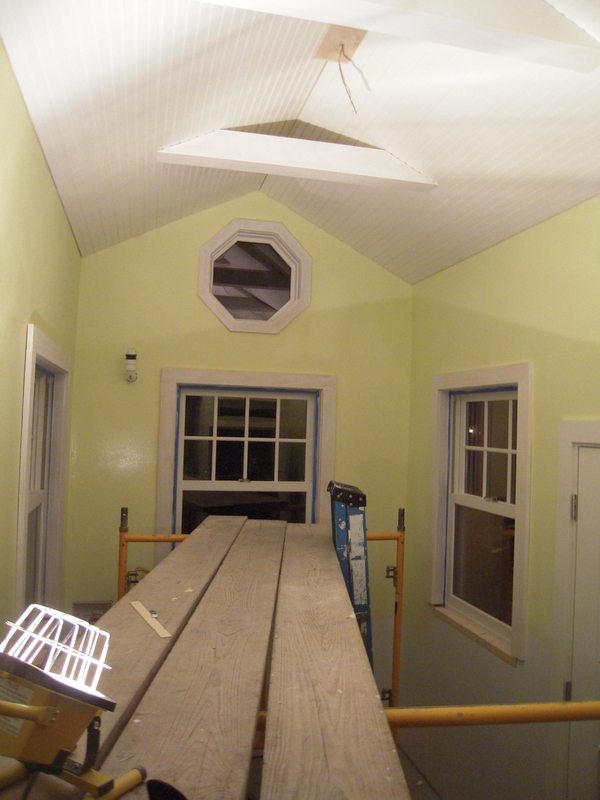 Here we have the windows installed. 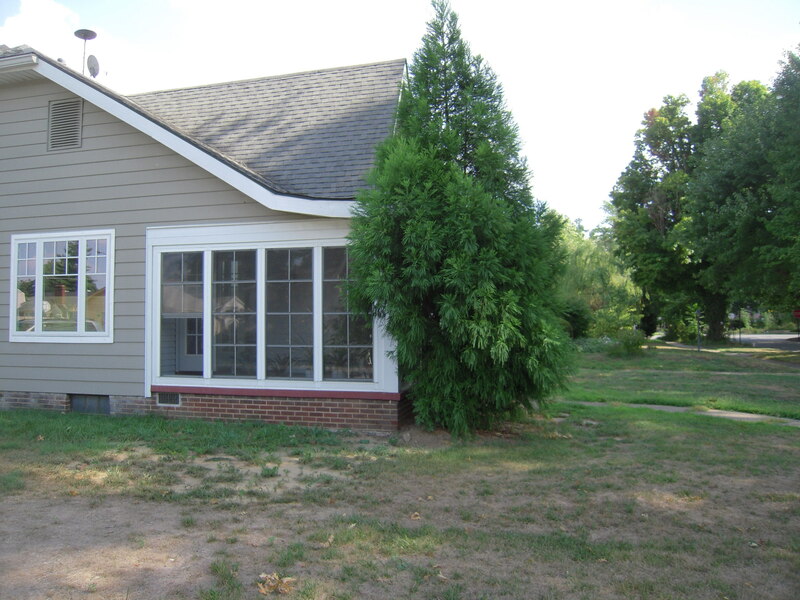 I used Marvin Ultimate double hung windows here. 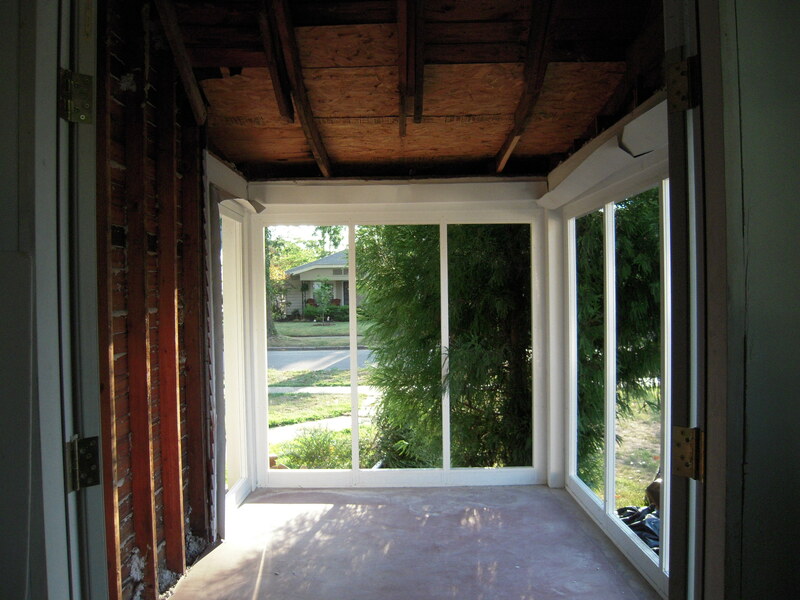 This is a traffic area outside – I used the double hung windows instead of casements to keep people (myself included) from running into open windows. 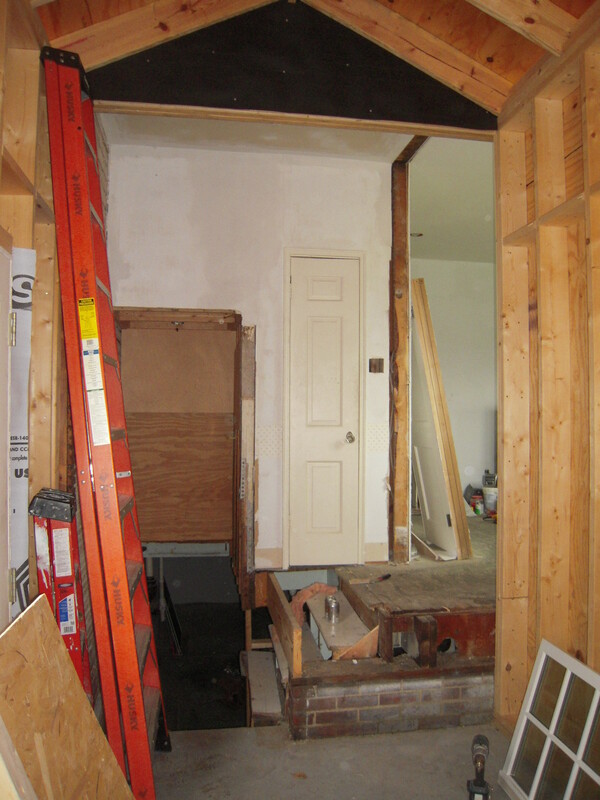 Here are the framing details for the basement door and entrance into the kitchen. The basement door shown is just a stand in – I’ll use the same type of door I used in the bathroom. It will have obscure glass instead of clear. 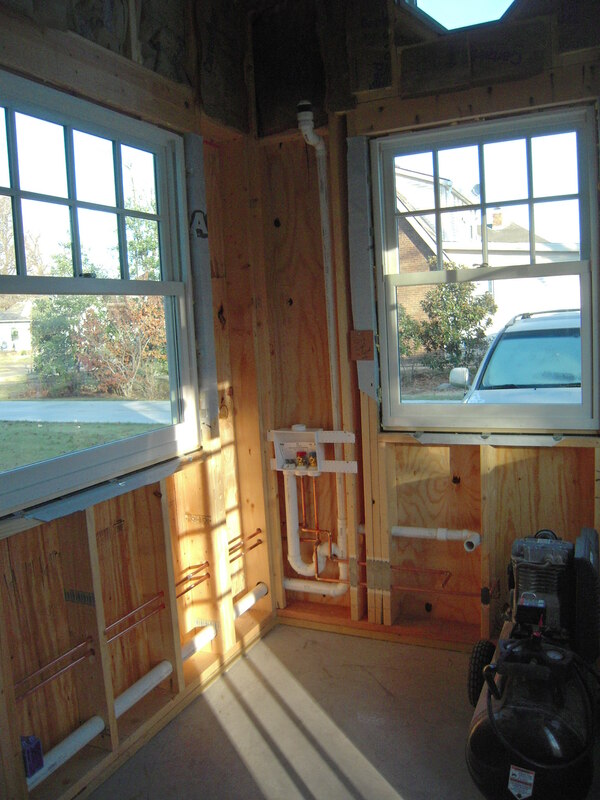 Above the door is an opening for a cold air return for the HVAC system. Typically you don’t have returns in bathrooms, kitchens and laundry rooms, but due to the volume of this space, it was an option. So of course I built one. 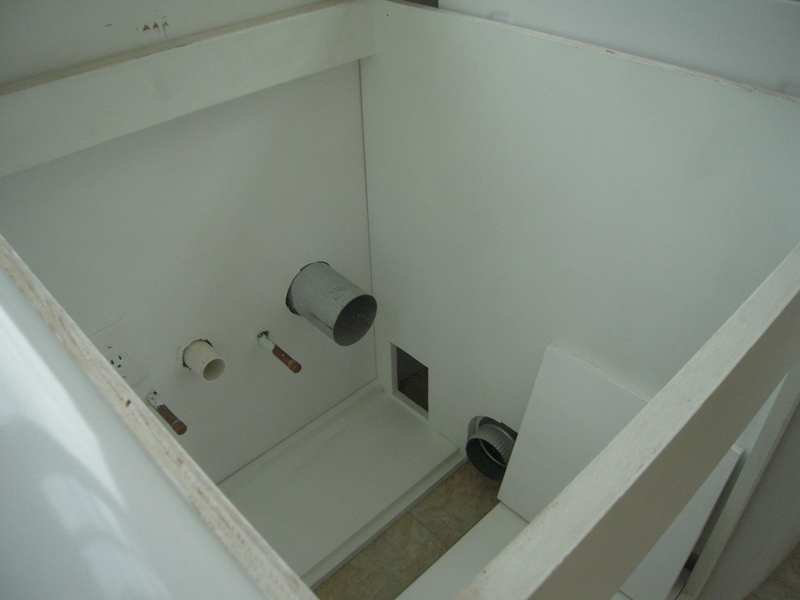 The plumbing is in place. Because I plan on having a counter over the top of the washer and dryer, I added an extra pair of water shut offs in the basement. If (if ever) I went on vacation there would be no way to reach the shut offs in the laundry box once the washer is in place. 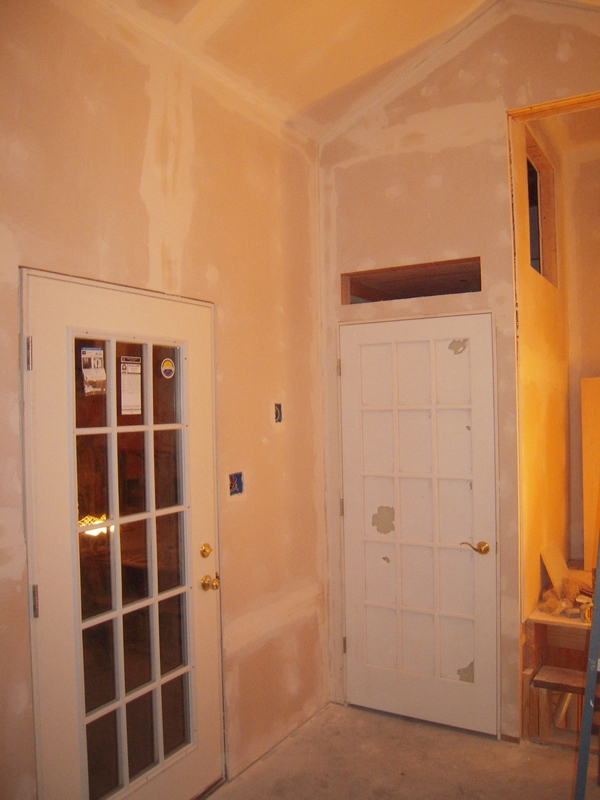 Drywall in. I used scaffolding for the ceiling. 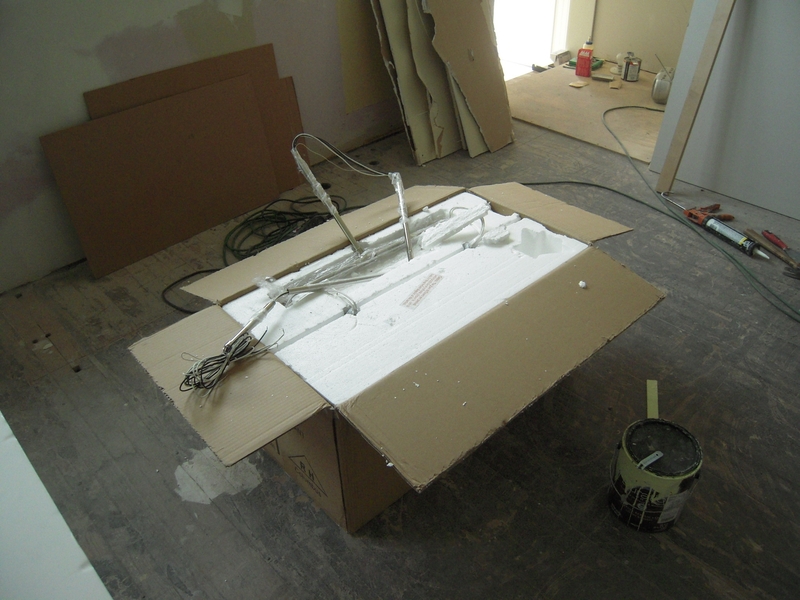 But I tell you – 5/8″ Firecheck type X drywall is pretty heavy stuff. It’s the last time I hang a ceiling without some help. 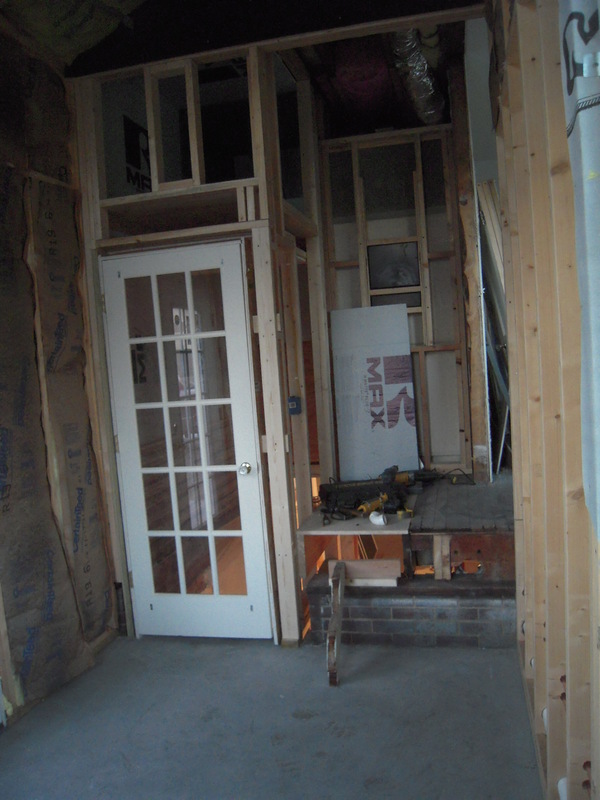 Here’s a better view of how the basement and back door are integrated into the space. 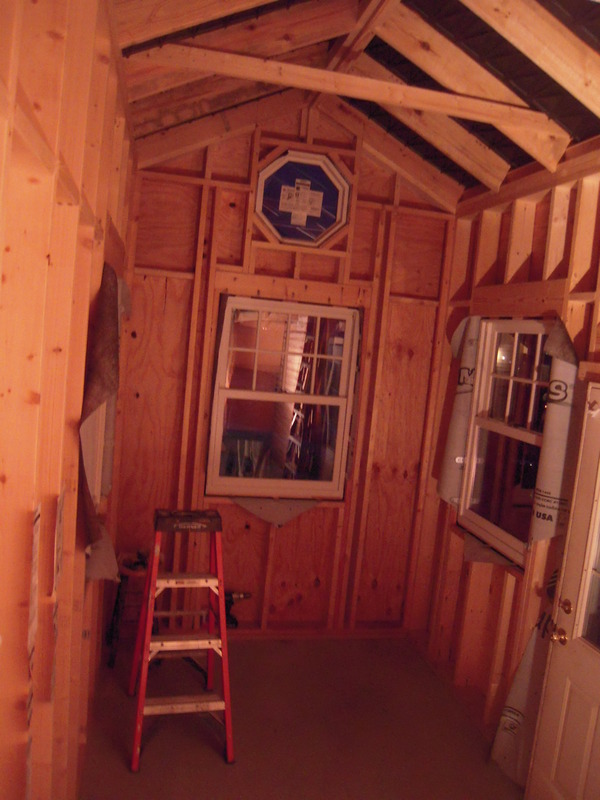 I’m trying to figure out the trim for the octagonal window. 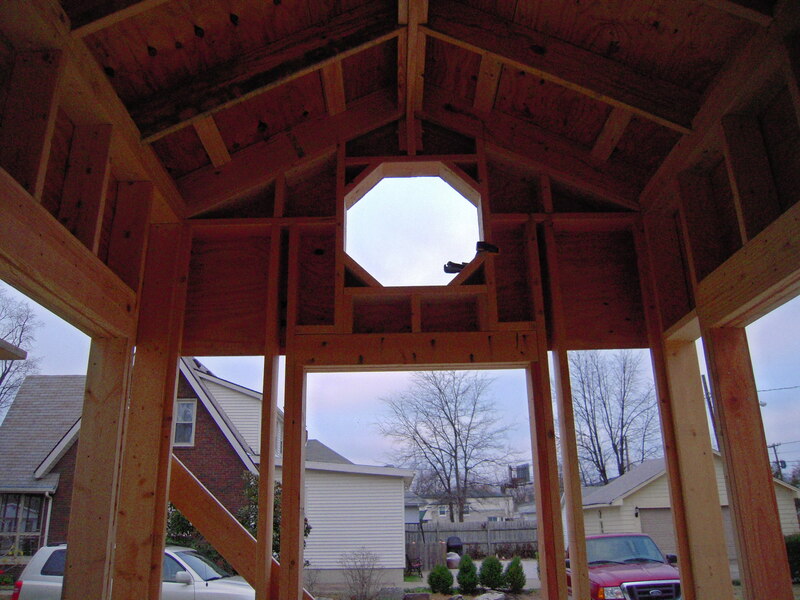 Since a 4 corner window would have 4 cuts at 45 degrees – an 8 corner window would have a 22.5 degree cut. Pretty simple. 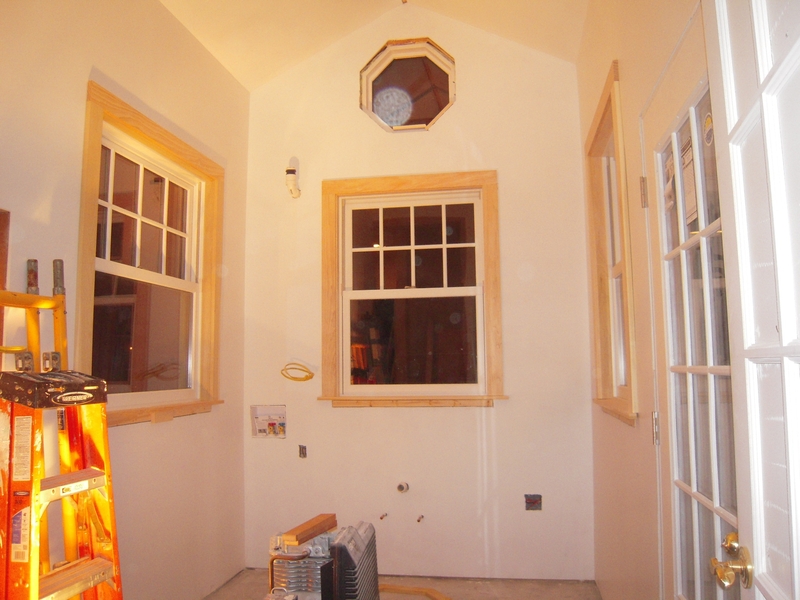 Starting the window trim. I use furniture grade poplar – it’s a little more expensive, but it sure makes trim work much easier. 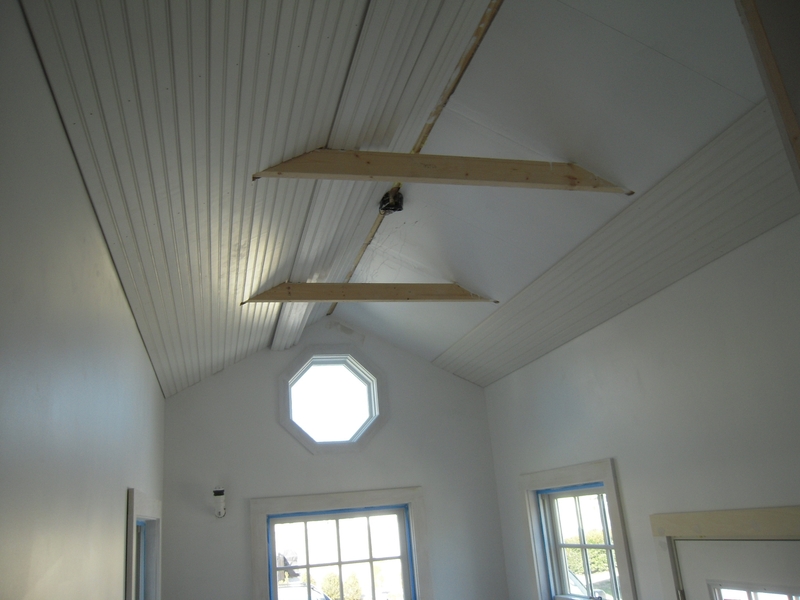 I decided to make the ceiling details using 3/4″ bead board. Well, we couldn’t make this project that easy, could we? Oh, I can make it even more of a challenge. 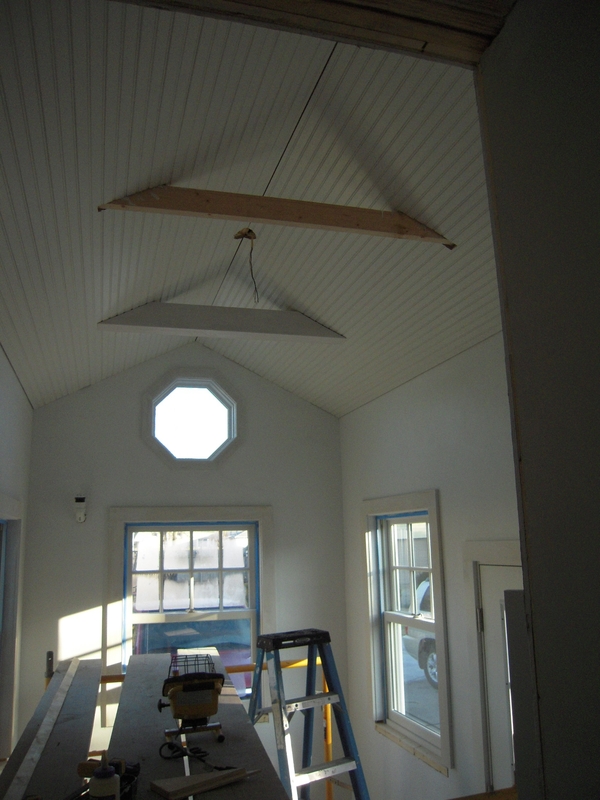 I want to make the ceiling bead boards seamless. 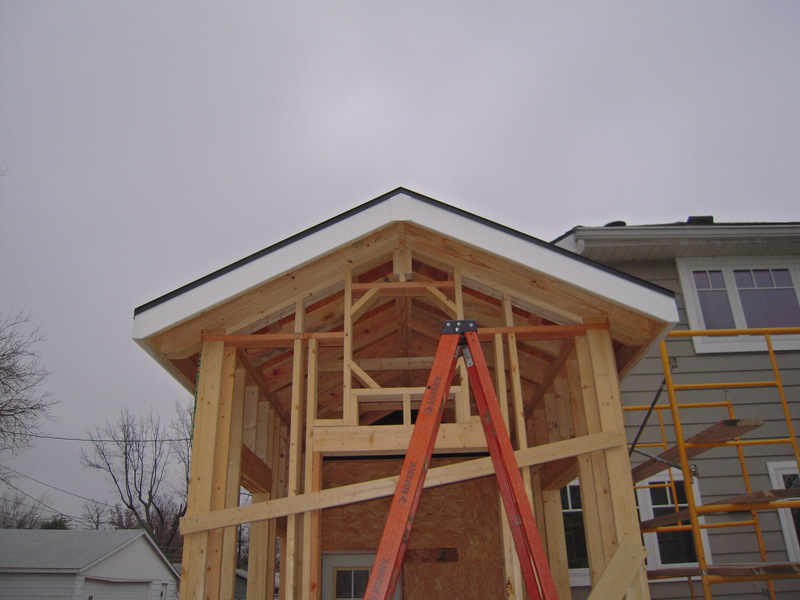 I had to bend the 12 1/2′ foot boards up over the roof collar ties. The notches for the collar ties had to be cut in place because if the notches were cut before bowing them enough to get in place they would just snap in two. You can see the boards laying on top of the ties ready to be notched. Bead board in place and in the process of wrapping the collar ties to give them a more box beam look. Time to add a little color. This is SW Springtime. It seemed overwhelming to me at first. I called in Francia who said she loved it. I think you’ll see that it does work when I build the cabinets in and add the wainscoting . I hate second guessing myself. Francia to the rescue again. 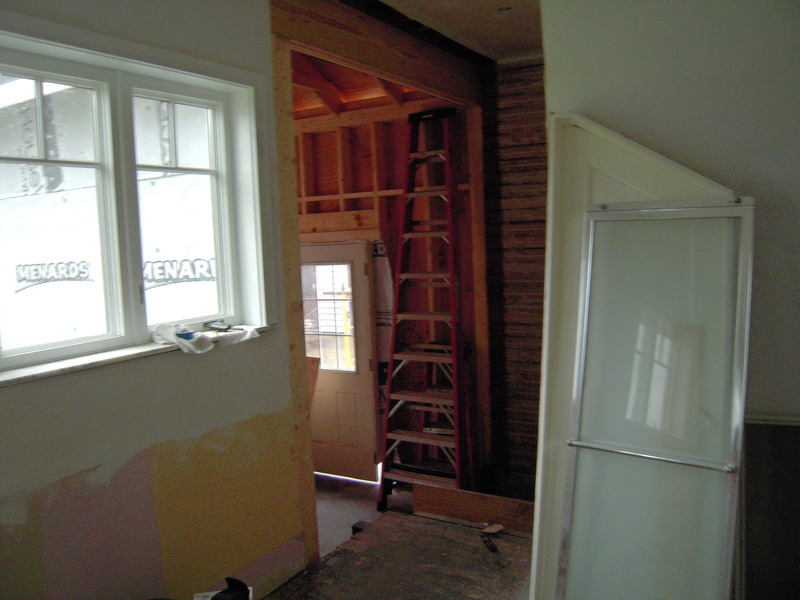 Continuing with the mudroom build – all the while you know there’s tantalizing drama with the sunroom foundation. I’m building this little room pretty much on my own – and I must say designing such a narrow room was a dilemma – and to top it off I’m doing it without a plan or even a shred of forethought in how this thing should look when it’s done. Oh, well – we’ll just doodle as we go. It’ll work out – or at least that’s what I tell my wife Francia. 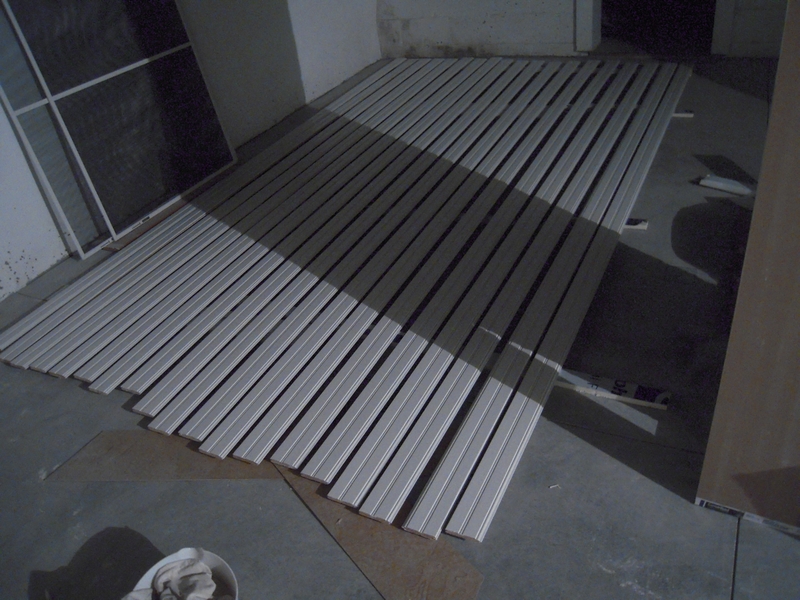 I decided to do all the rakes and eve gutter boards with Azek trim. I checked out every brand and I think this is the best quality pvc trim out there. This is the stuff I used around the shower, and it looks just like wood when painted. 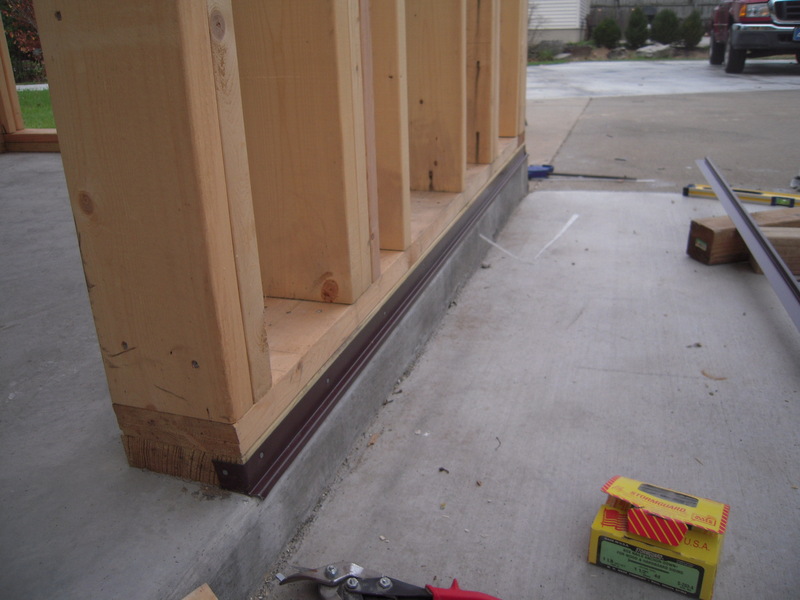 Here I’ve added some sill flashing over the slab foundation. The bottom plate for the walls need to be pressure treated when they come in contact with concrete. I used kiln dry pressure treated. It’s straight and dry – it’s worth the extra money to use this over the ‘wet’ pressure treated lumber from the box stores. The plates were held back from the edge of the slab foundation so that the 1/2″ CDX plywood sheathing will fit flush to the slab. 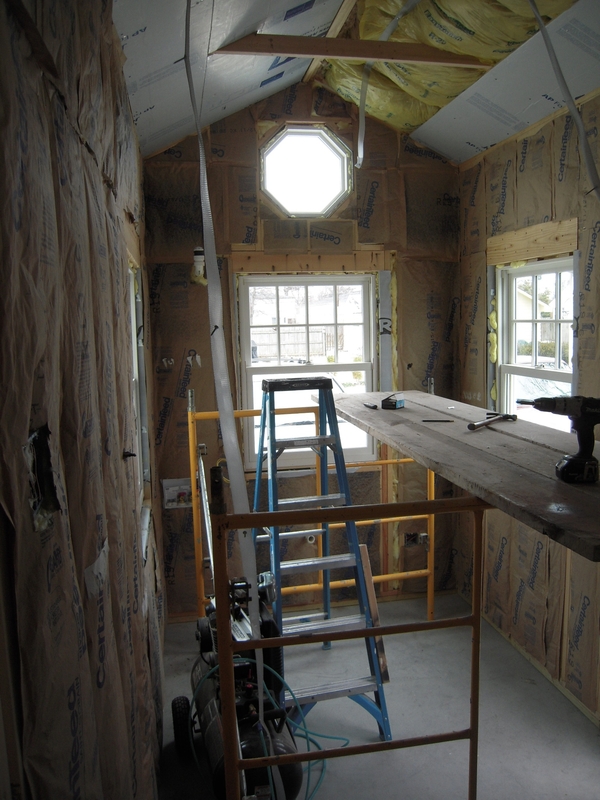 Here is the beginning of the sheathing – one way to make this narrow room look bigger is to put a lot of windows in there! 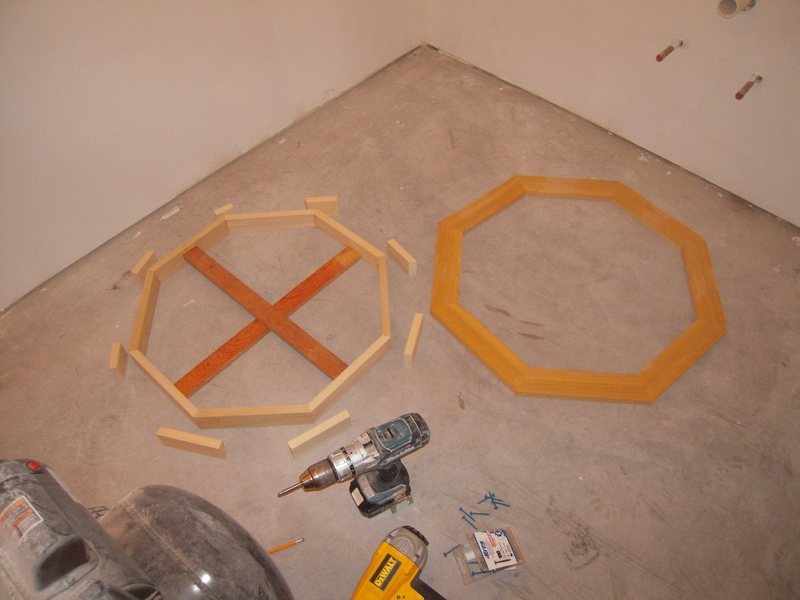 This top one will be a 2 foot octagonal window. I’ll have a stained glass piece made for this later – way later. Here’s an inside view. You can see I love making the walls with lots of framing elements. Don’t I have anything better to do? This stuff gets covered up, but I (and you) will know it’s there. At the top of the photo you can see the outriggers that hold the fly rafters notched in the roof trusses. I’ll make this a vaulted ceiling to give this space some volume. This is looking from the kitchen. 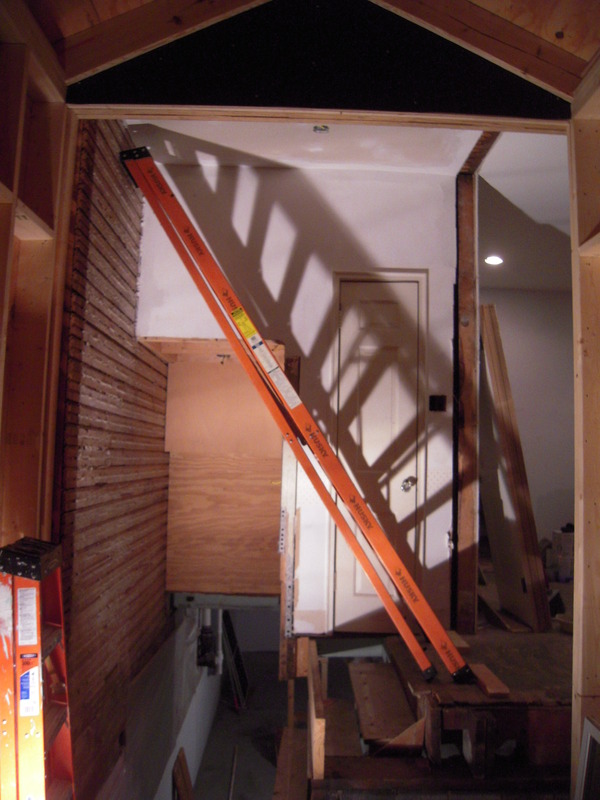 To the right of the ladder was the original exterior wall. What’s that shower door doing there? Oh, I was tearing up the upstairs bath for a future remodel. How unusual. 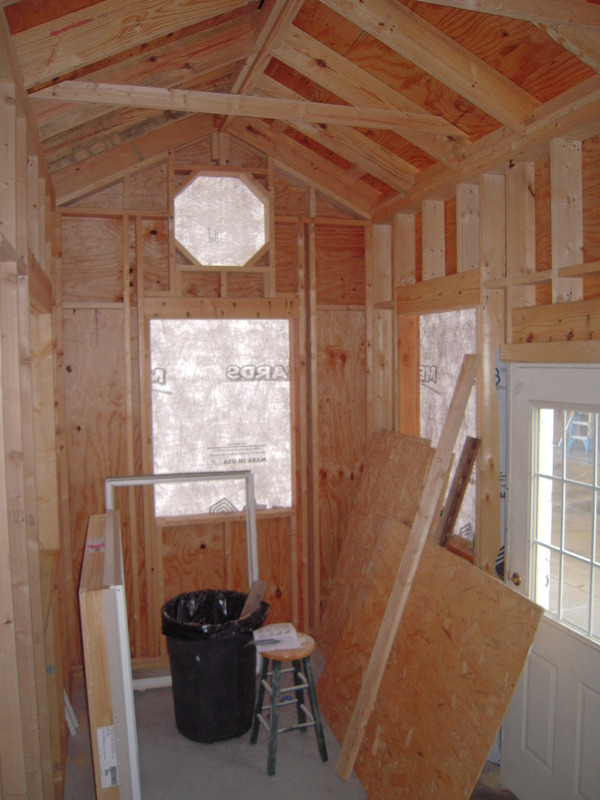 Here’s the interior with sheathing and housewrap on. Kinda cozy, don’t you think? So you can see the design. 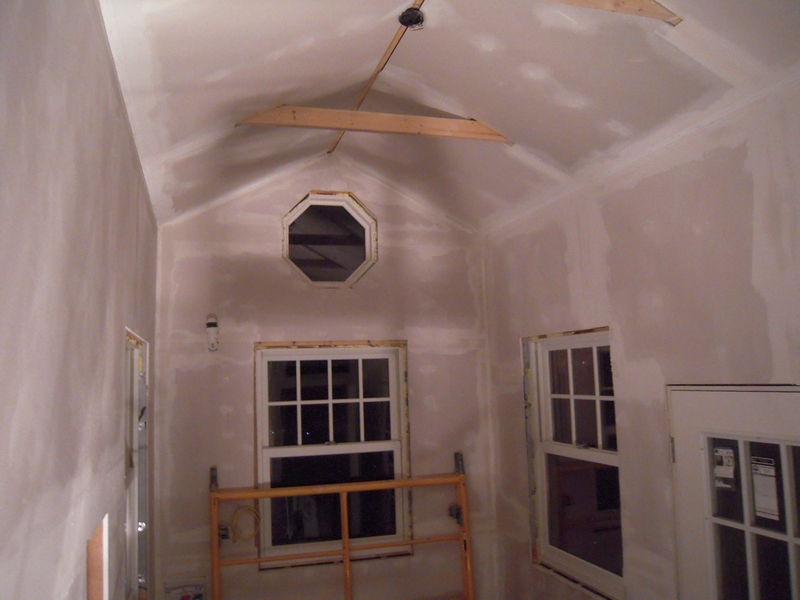 Vaulted ceiling, four windows and eventually a full glass door. After making lots of design changes, I settled on walls that were 10’2″ to the plates, the center of the ceiling about 12′. With walls only 7′ across I’d say that qualifies this room as a tall skinny boy. 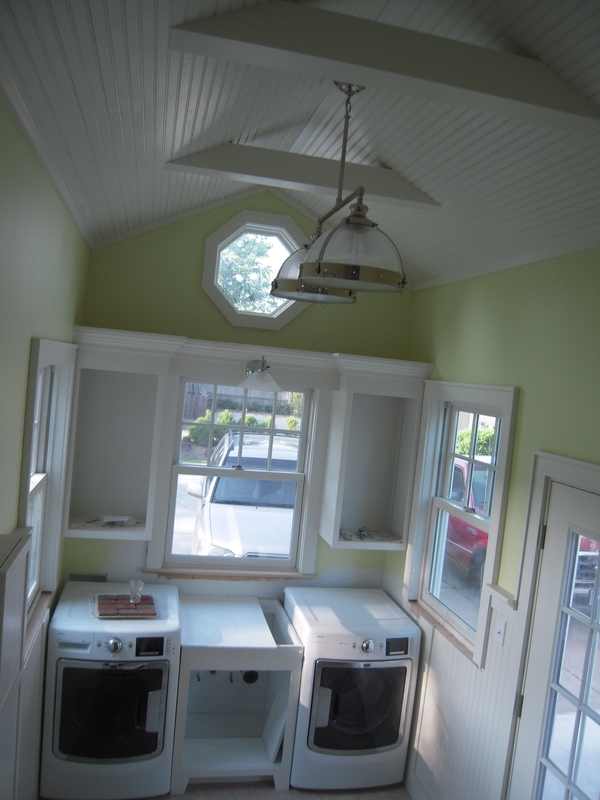 Looking back into the kitchen from the mudroom. You can see the original opening for the back door, the now-removed landing and the steps (a place for my Diet Coke cans) that went up to the kitchen. Also the pantry door that has no pantry behind. Here’s my attempt at dramatic photography. Now that I have removed the stair landing to the basement, it’s a little precarious working overhead. 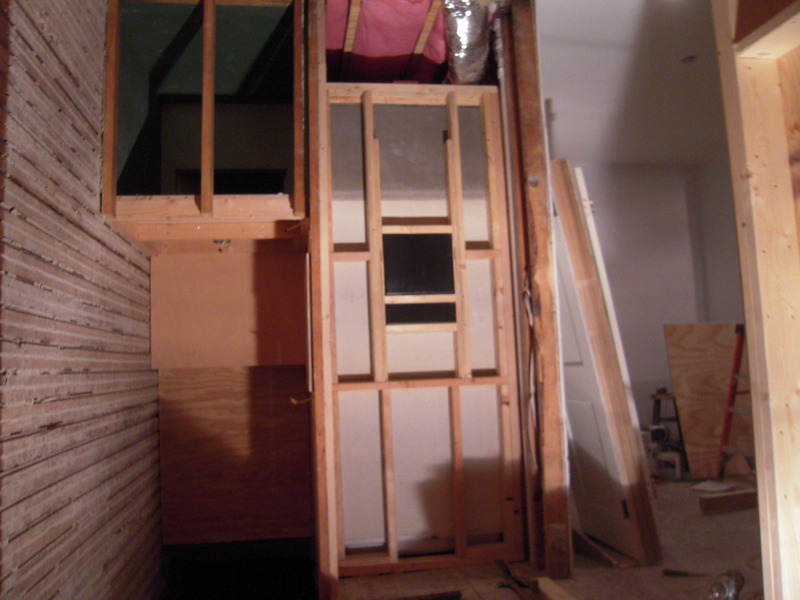 Now the little pantry-less pantry door is gone, exposing the back of the shower. That green rectangle in the upper left hand is the extended closet storage that goes all the way into the bathroom. I think that space will hold like a thousand rolls of toilet paper. And here’s why we did this little room in the first place. 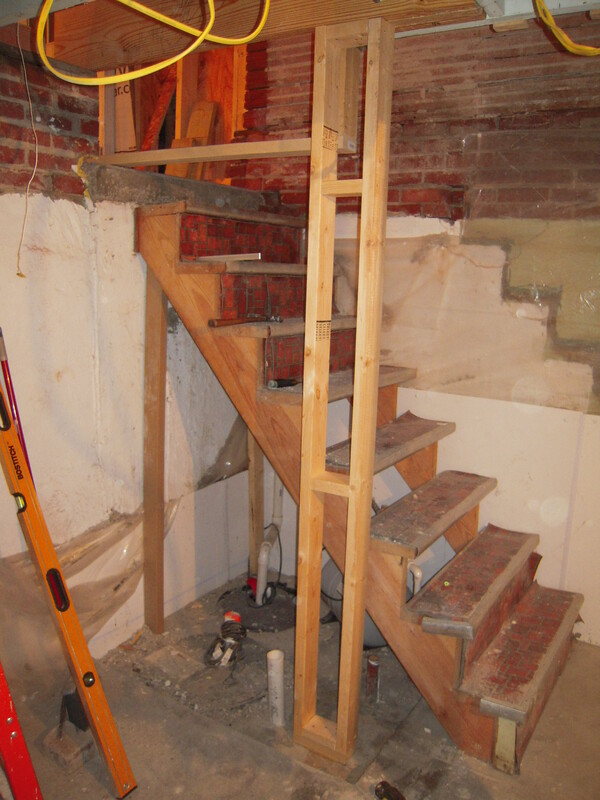 You can see on the wall where the stair with landing was, and now we have the room to make a normal, comfortable staircase to the basement. But it’ll be a while before that happens. Remember I just destroyed the upstairs bath. Stay with me, it’s gonna be a bumpy (and long) ride. 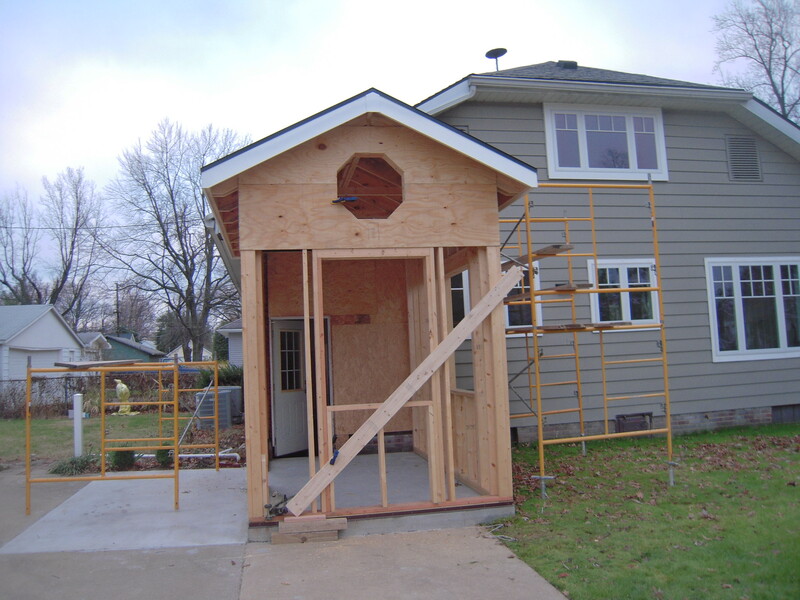 Well, I know I was supposed to start the chapter of room addition #1 in this next post. 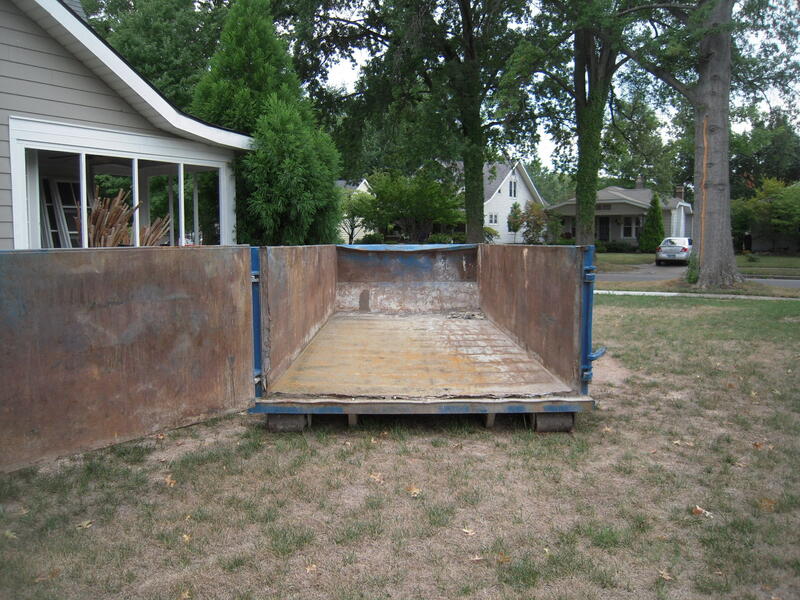 But…so many interesting things have happened since that big blue dumpster arrived last week. 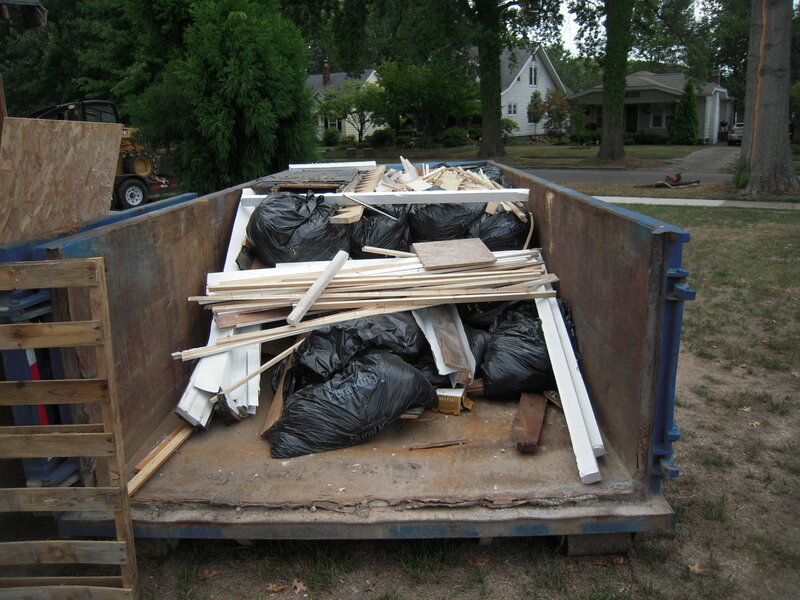 So to refresh your memory the 20 yard trashcan looked like this. Think of the possibilities! I only have this for a week, so we better get busy. 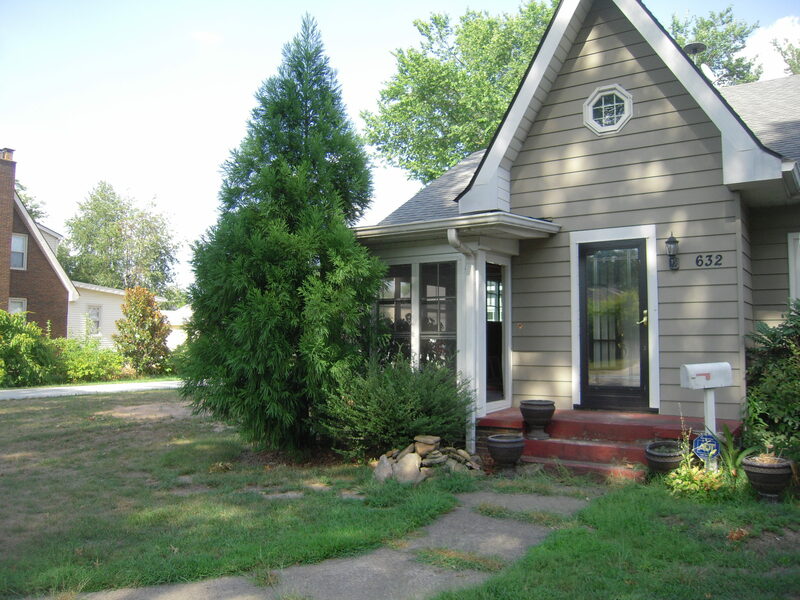 Here was the front before. My poor tree is doomed. No takers on Craigslist. And here was the side. I say ‘was’ as you will see in a minute this will change. 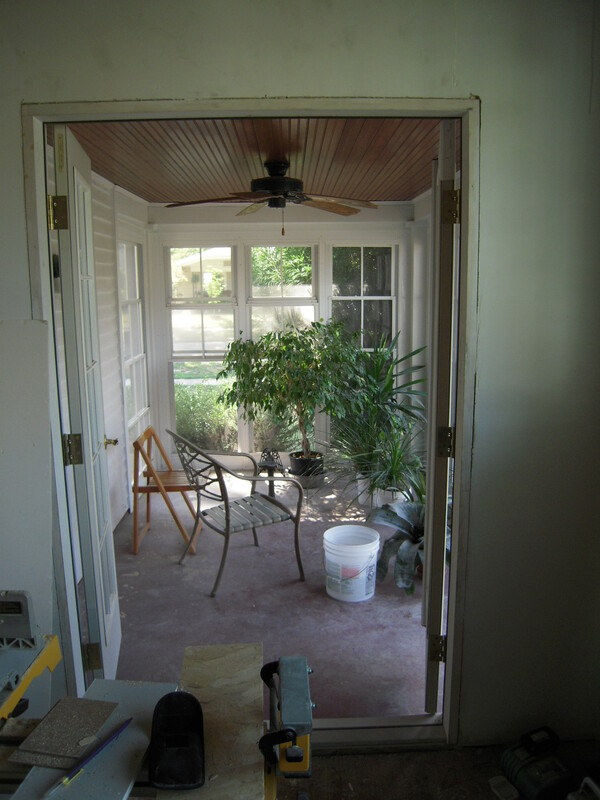 Here’s looking at the interior of the small porch. I think I want a skylight. And looking out. It’s a pretty skinny room out there with a concrete floor. So let’s gut this! I have a dumpster to fill. Out with the screens. My favorite! 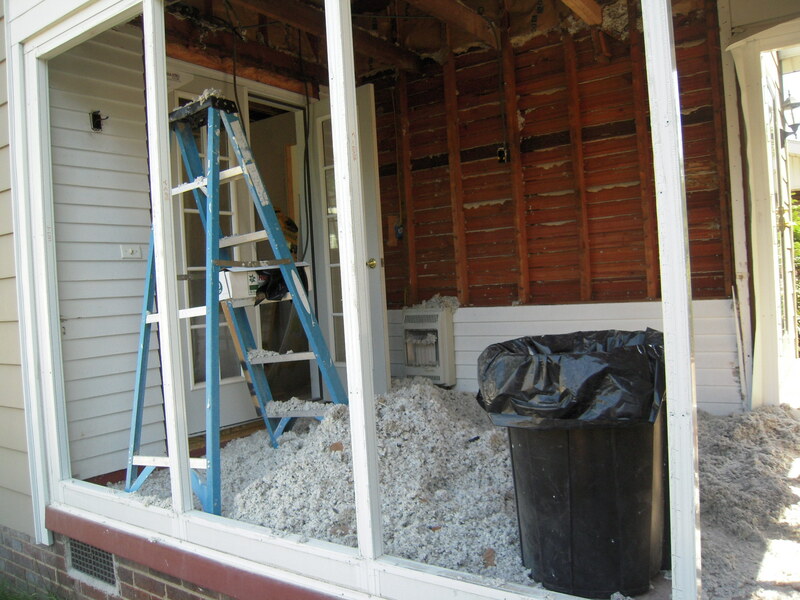 Blown in insulation – snowing in August! Maybe that skylight is a little larger than I anticipated. Two thirds full and it’s only a day after the trashcan got here. Stay tuned – there’s some interesting developments coming up. I’ll need your extra good karma this time.